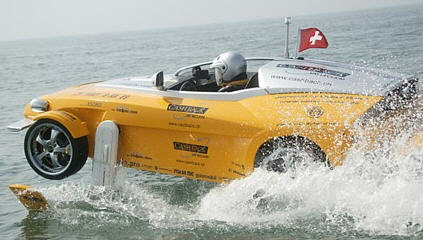 The Rinspeed 'Splash' amphibious car zoomed across the English Channel in just 3 hours and 14 minutes, setting a speed record for hydrofoil cars. The record-setting version of the Splash was extensively modified from the original version, which debuted at the 2004 Geneva Motor Show. The structure was considerably strengthened for offshore use, and a new powerplant was provided by Weber Motor. The lightweight 750 cc, two-cylinder engine puts out 140 hp at 7,000 rpm, good enough for a top speed of 80 kph on smooth water. See more Rinspeed 'Splash' pictures.